Muddy Waters is a Tom Wagner variety. Tom, from Everett, Washington has been one of the top tomato and potato breeders of the past 40 years and has brought all sorts of new varieties to market. 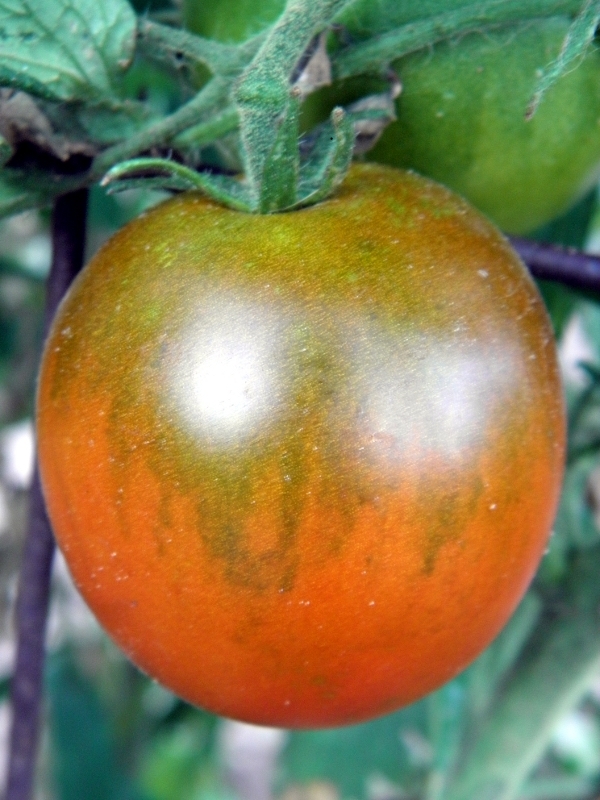 His Muddy Waters with gold stripes and indigo shading on a green background is a really good-looking tomato which will have all your neighbors talking. It is a nice sized slicer, about 8 oz. and the flavor is full, complex and intense. A restaurant in Santa Fe was taking all of these we could supply this summer. $1.00 of the price of a packet will go to support Tom's research, but more importantly, we encourage everyone to visit his website, http://www.tomwagnerseeds.com/ and see the remarkable work being done on Tom's farm.